This circuit is a modified version of an original interface on QSL Net. 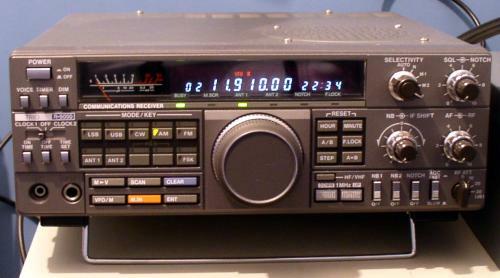 It is a fully isolated interface allowing computer control of the Trio/Kenwood R5000 receiver. Separate software is needed to control the receiver. The R5000 receiver is an all-mode full featured receiver covering 30-30MHz. This receiver is now discontinued but there are still plenty to be found on the second hand market. It has an analogue field strength meter, two built-in noise reducers and a 6 Pin DIN output on the back panel. It is this DIN connector that interfaces to your humble PC allowing software control over the receiver. What does a Trio / Kenwood R5000 look like ? The R5000 receiver outputs are TTL level compatible, but to interface to the PC serial port, RS232 standards are required. All the work is done here by the MAX232 IC working from a single %V regulated supply this IC will buffer and shift the TTL levels of the receiver to the standard required by the RS232 serial port. The output signals are shown correctly wired for a 9 Pin D type connector, most PC have at least two of these connectors on the rear. The signals from the R5000 receiver are physically isolated by 4 opto-isolators, SFH618. The receivers transmit and Ready to Send (RTS) outputs have series 150 ohm resistors before the isolators. The receive and Clear to Send (CTS) inputs, are fed direct to the opto isolator inputs. All the opto-isolator does is relay on/off conditions between input and output, but as there is no direct connection between input and output, physical and spacial separation is achieved. Sadly the R5000 is discontinued, but there are still plenty available on the second had market. As for control software, a search on Google should prove useful.